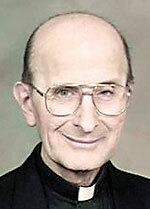 Father Harry A. Romano, 84, pastor emeritus of Our Lady of the Rosary Parish in Coatesville, died Oct. 1. Born in Philadelphia, the son of the late Ignazio and the late Rose (DiTollo) Romano, he attended Thomas J. Powers School, Jones Junior High School and Northeast Public High School before entering St. Charles Borromeo Seminary. He was ordained May 11, 1957 by Archbishop John F. O’Hara at Immaculate Conception Church, Germantown, Philadelphia. Msgr. James J. McDonough, a seminary classmate, well remembers him as a brilliant student who took his vocation seriously. “When the bell rang for silence he would stop talking in mid-word,” he said. They remained friends throughout the years and Msgr. McDonough, who preached at Father Romano’s silver jubilee at Our Lady of the Rosary, remembers how beloved he was in his parish. Father Romano was also very musical, his niece recalls. He could play a number of instruments, and directed a large Dixie Land band at Cardinal Dougherty High School. And also while in residence at St. Timothy Parish, Philadelphia, he directed an 80-voice boy choir. Father Romano’s first assignment was briefly as parochial vicar at Immaculate Conception Parish, Kelayres, Pa., with subsequent assignments to Cardinal Dougherty High School and parochial vicar at St. Mary Magdalen De Pazzi, Philadelphia; St. Michael the Archangel, Levittown; and Holy Cross, Springfield. He was appointed pastor of Our Lady of the Rosary in 1976 and pastor emeritus in 2003. At Our Lady of the Rosary, he was a pastor the people could get along with, “a very holy man. He listened and tried to implement suggestions,” said Gene Spratt, a former parish office manager. In addition to making necessary renovations, Father Romano was especially attentive of the devotional life of the parish, encouraging Forty Hours devotions and novenas to the Sacred Heart, Miraculous Medal and St. Jude, Spratt said. Father Romano’s funeral Mass will be celebrated by Archbishop Charles J. Chaput at Our Lady of the Rosary Church on Saturday, Oct. 6, 10 a.m.
Concelebrants will include Msgr. Ignatius Murray, Fathers Thomas Brennan, John Ferrance, O.S.A., John Fitzgerald and Msgr. McDonough, who will be the homilist. Father Romano is also survived by his sisters in law, Dolores Romano and Helen Romano; nephews Joseph, John and Richard Romano and nieces Linda Naegle and Rosemary Twomey. Interment will be at St. Dominic Cemetery, Philadelphia. PREVIOUS: Sister Catherine Shean, M.M.S. NEXT: Sister Patrick Marie Doherty, I.H.M.